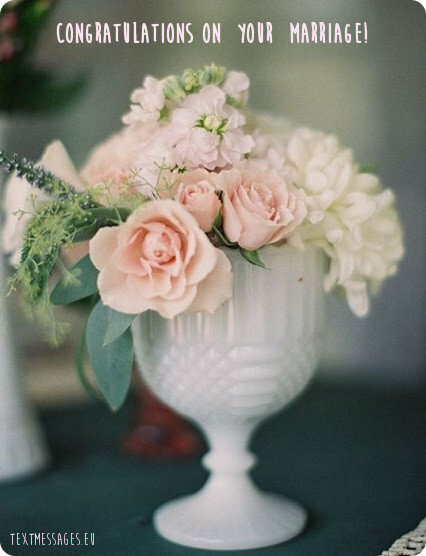 Wondering what to write in text message for a newly wedded couple? 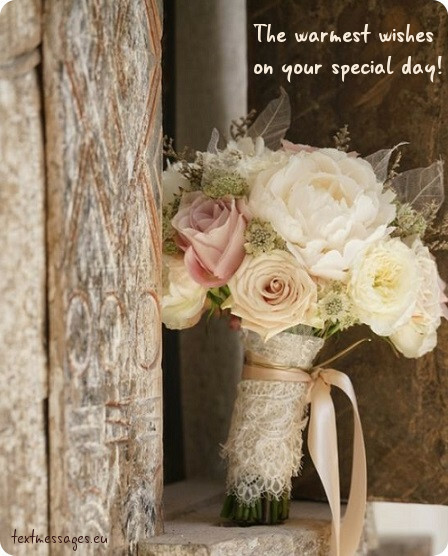 It is not an easy task to create a nice and original greeting. 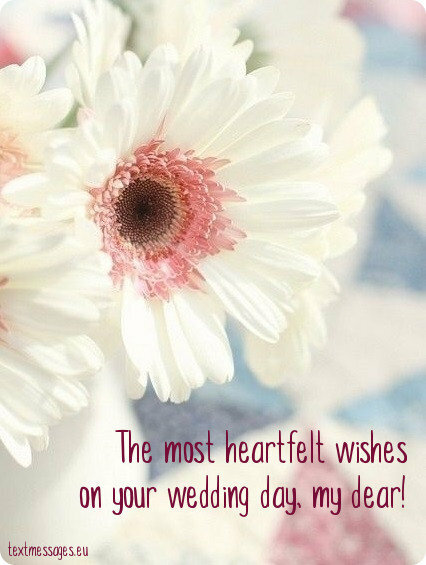 If you are in lack of words, here you‘ll find a collection of short wedding wishes, messages and quotes. 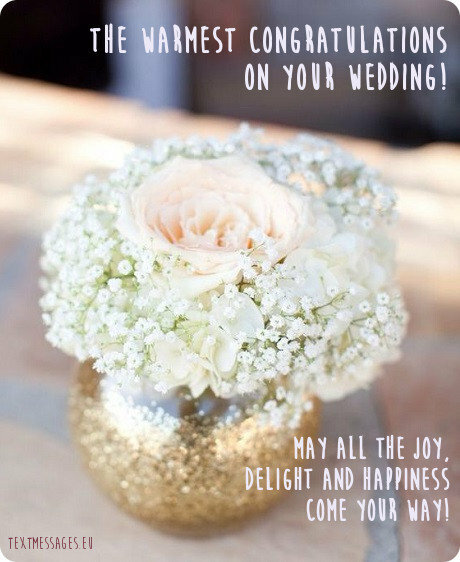 Pick up one of them, customize it by adding some words of your own, and you will get a unique wedding greeting. 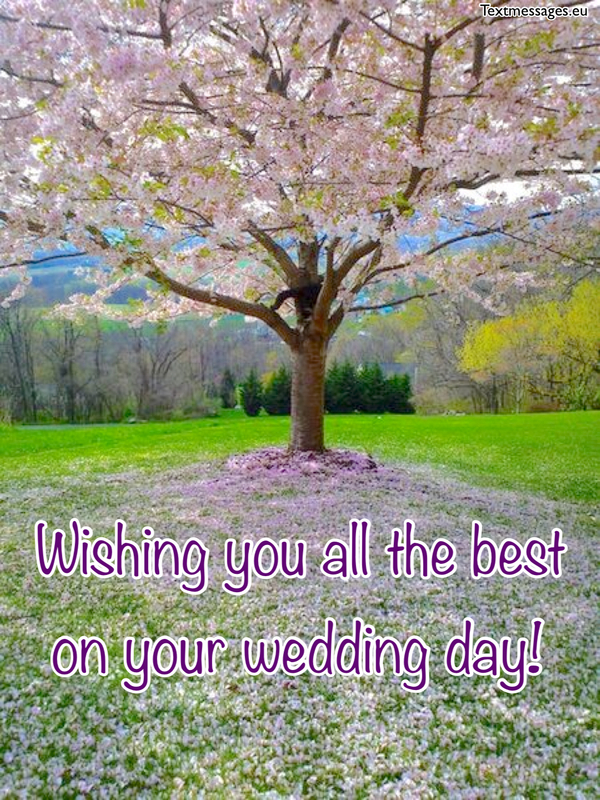 Here you will also find a great collection of wedding greeting cards and images. Marriage is not just uniting with a person you love. It’s also accepting his or hers believes, habits and preferences. Wishing you to always be patient to each other! Wishing that this hangover of love never fades away! Happy wedding! 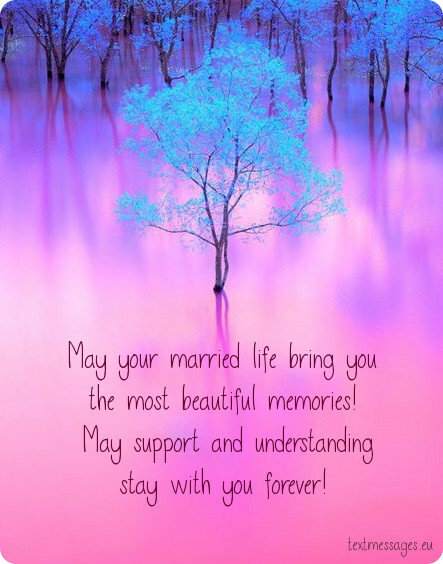 May goodwill and friendship always stay in your marriage! Wishing that your love lasts till your last breath! Let your marriage live as long as the sun does. Give each other the best that you can and love for no reason. It is a blessing to find a true love and to share one dream with your partner. Happy wedding! May love, harmony and understanding be aims of your marriage union! Congratulations! 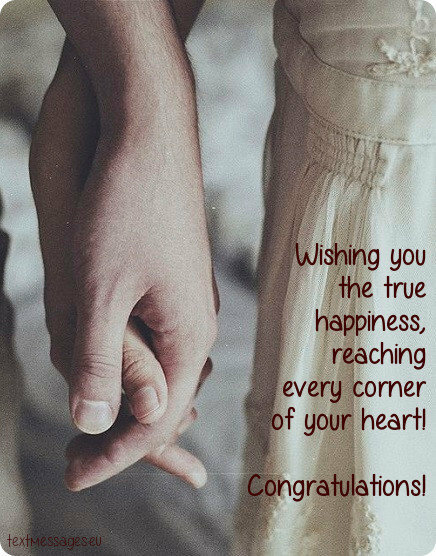 Wishing you the true happiness, reaching every corner of your heart. May you always stay happy together! 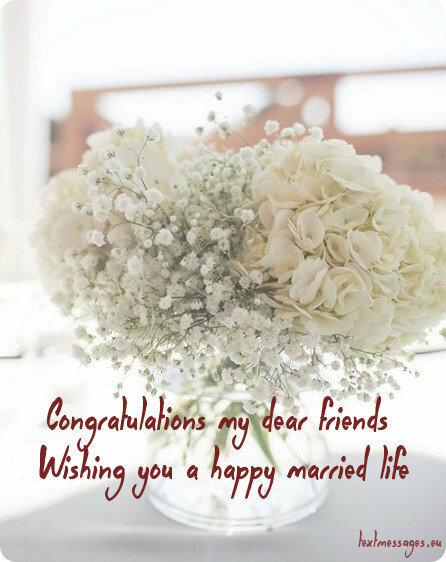 Wishing you a happy married life, my dear! 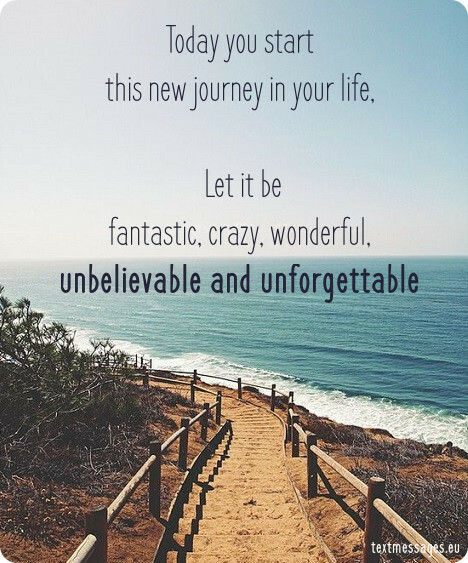 Let it be fantastic, crazy, wonderful, unbelievable and unforgettable! There are three the most important birthdays. Our own birthday, birthday of a family on the wedding day and the birthday of your own child. Be happy! This amazing day promises to be the best one in your lives. Make the most of it and be truly happy together. What comes up to your mind when you think about wedding? The union of two hearts, two souls, two lives that will become happy and complete. You can make a common wish on the day of your wedding. The wish to be happy for many long years. I believe, it will come true. When I hear the expression “a match made in heaven”, I immediately think of you. You are definitely destined to be together. I’m extremely happy for you. Congratulations! May you be just as happy as in your wedding photos! Growing old together is not as simple as you may think. But I’m convinced that your love will conquer everything. Congratulations on your wedding! The fairy tale you are about to live in is the biggest happiness a person could ever receive from this world. Wishing you to successfully keep it. Congratulations! Love is not a perfect fairy tale without problems and fighting from time to time. Love is a hard work, but I know that you guys can handle it. You are inspiring. Wishing you the best of all, don’t forget to be happy. At first I wanted to wish you a lot of patience, but then I realized that there’s no need. Because you guys are the most amazing and harmonious couple in the world, and patience has nothing to do in your relationship. It’s only about love. Congratulations! Getting married is one the most important decisions in life, and sometimes people doubt if it’s really worth it. But looking at you I know that you are sure of each other. Your love makes me believe that magic is real. Wishing you all the best. The first time ever I saw you together I knew you were meant for each other. Match made in heaven, that’s what people say, right? Looking at you now I cannot be happier. I wish your love to last forever. Congratulations on your wedding! When I look at you I feel so much love. The way you look at each other is just indescribable. I know that your love is something absolutely special and it will help you to overcome all the difficulties. Congratulations on your wedding! Love is an everlasting fire that keeps you warm when things you say to each other hit you with cold. I know that your feelings are strong enough to make your relationship last forever. Hold on to each other. Congratulations! On that beautiful day my wish for you is to always listen to each other, no matter what. To be patient and understanding, because this is the only way to stay together. I believe in you and your love. Congratulations on your wedding. I’m so extremely happy to witness the very beginning of this beautiful marriage, cause you guys have always been such an inspiration to me. Wishing you lots of love, kids and fun in your union, and I will always be there to support you no matter what. Congratulations! Getting married is a giant step on your way of life. And it is important to walk with someone you really love, with someone you fully trust. I know that you’ve made a right choice. I can see it in your eyes when you look at each other. Be happy, congratulations! Happiness is when someone you love and adore stands right beside you with a ring on a ring finger. I wish you to always smile as bright as you do now. Everything is going to be amazing as long as you are together. Congratulations! When somebody asks me if I believe in true love, I always say yes, because I immediately picture you in my head. Your love is so pure and inspiring, I have no doubt that it will last forever. 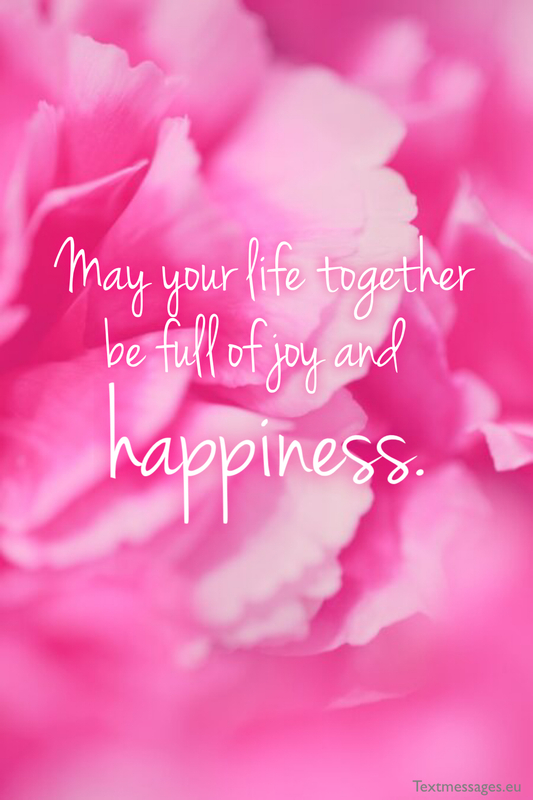 May your life together be full of joy and happiness. I have never seen a couple this beautiful. The way you look at each other makes me believe in true love, and I wish you both to keep looking at each other the same way for ever. I know you can do that. Your love will guide you. Congratulations! Wedding is such a headache. You have to make everything look perfect, and sometimes you forget about real values of this event. It’s only about love. I wish you to always remember that. Congratulations on your wedding! You both have been blessed with true love. I can see it when you’re holding hands and laughing at each other’s jokes. True love’s hard to find, and to keep it is a hard work, that’s why I wish you to always have strength to be together no matter what. It’s always worth it. Congratulations! Marriage is not a beautiful fairy tale. And you will understand that sooner or later. But marriage is something that helps you to cope with everything if you have the right person by your side. I know that you’ve made a right choice. Congratulations! The fact that you have each other is the most beautiful thing in the world. 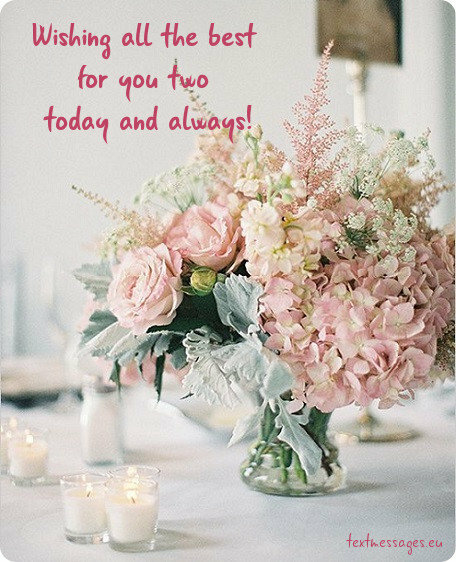 May your love grow stronger with every day, may your friendship be endless, may your life together be full of understanding and support. Congratulations on your wedding! Today is a beautiful day. The birds are singing, the sun is shining, but there is someone who shines even brighter than the sun. It’s you guys. Your love illuminated you from the inside, and that’s all you need to build a happy marriage. Congratulations on your wedding! You make each other so happy. I can see it in your smiles that appear on your faces when you look at each other. It’s precious. I wish you to always be as in love with each other as you are now. Congratulations on your wedding! Making each other laugh is the most important thing in relationships. You can argue and fight from time to time, but a nice joke will fix everything. I wish you to always find a way to laughter. Congratulations! To be a part of this beautiful event is very important to me. I can almost feel your endless love for each other under my skin, it’s just everywhere. I wish you to always remember this day and the way you look at each other right now. Be happy! Make your home and family be the safest place on Earth. Congratulations on your wedding! To love somebody is a hard work. You have to always make sure that this person is healthy, happy and satisfied, because it is the most important thing in the world for you. I wish you to never be tired of this. 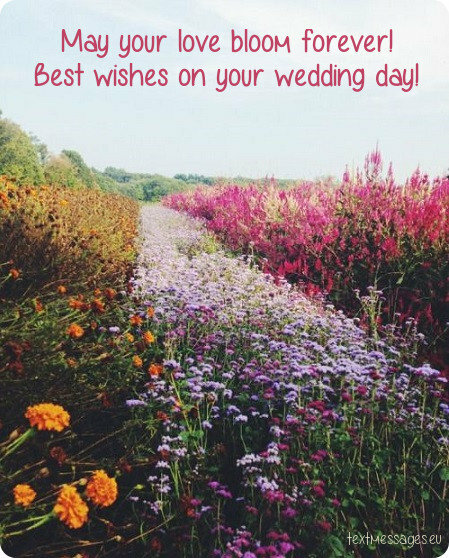 Wishing you all the best on your wedding day! Marriage is about making each other happy every day of your new life. It will be hard, but your love will make it so much easier. Don’t you ever forget why you said “yes” today. Congratulations on your wedding! Your love is special. Everyone notices it when they see you together. I wish you to always keep that same energy between you two. Congratulations on your wedding! Living with someone is a hard work. Especially if this someone is your wife or husband. But I know that you two will cope with everything together. You are a match made in heaven. Congratulations! 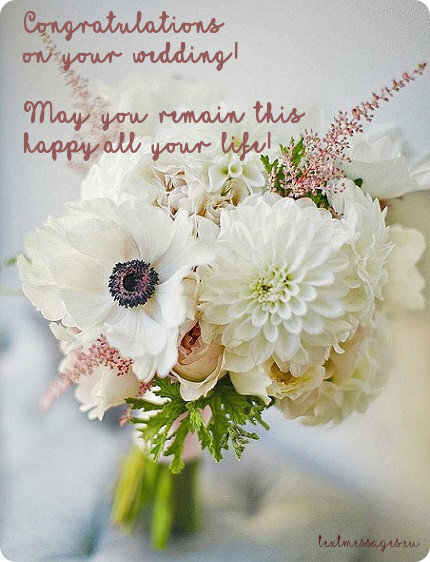 Wishing this day be the start of the best time of your life. Love is such a beautiful thing. And there are people who make it that beautiful. You are one of those. You are such an amazing couple, I admire you and wish you all the best. 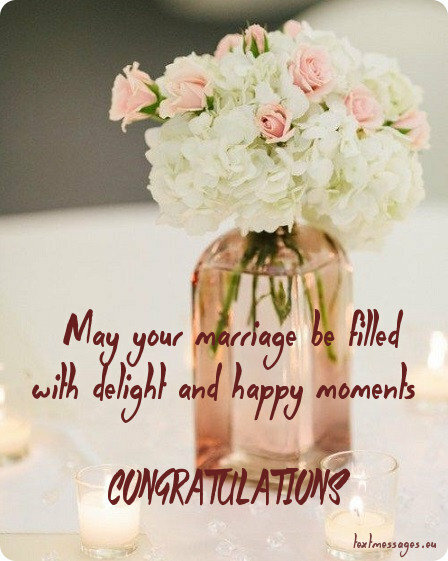 May your marriage be full of happiness and joy. Happiness is hard to find. But it’s even harder to keep. I wish you to always have strength for making it work. Do your best – and everything is going to be just fine. Congratulations on your wedding! It’s always easy to be happy together. The hardest part of marriage is to stay together when times get harder. You have enough love for each other to keep your relationship even if it’s not doing great. Stay strong. Congratulations! Love is not just a beautiful fairy tale with no problems. You should work on it. You should take care of it and learn how to be patient with it. I know you can do that. 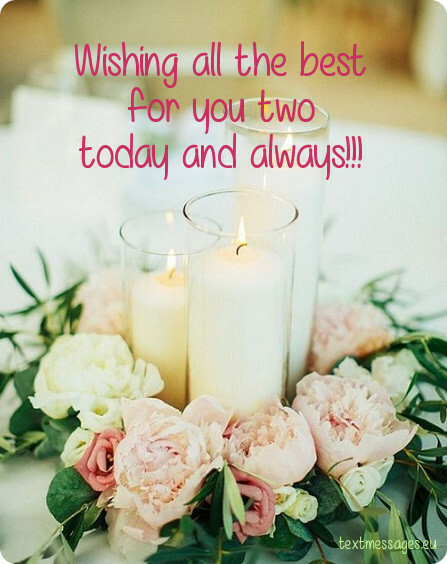 Wishing you all the best in your life together. Congratulations on your wedding! You need to learn so much. Marriage is all about learning. Sometimes it will be very easy, but it can also be extremely hard. You have to be prepared for this. I’ll give you only one advice on how to stay strong: keep loving each other. Congratulations on your wedding! God bless the day you two met each other, because it was the day when true love was born. I genuinely think that you are a match made in heaven and wish you the best of all. 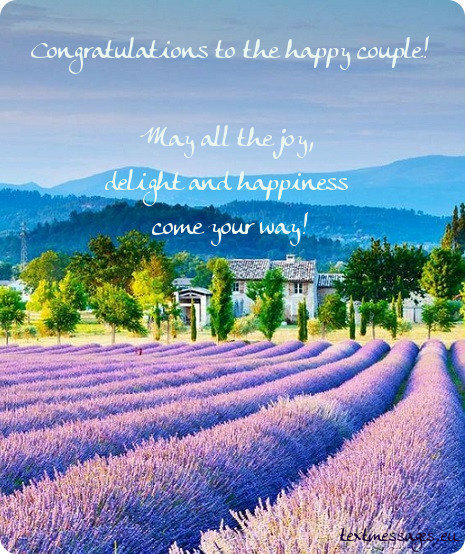 Congratulations on your wedding, be happy together! Looking at you two being so perfect together makes me believe in true love again. I believe that you will last forever and everything is going to be just fine between you. 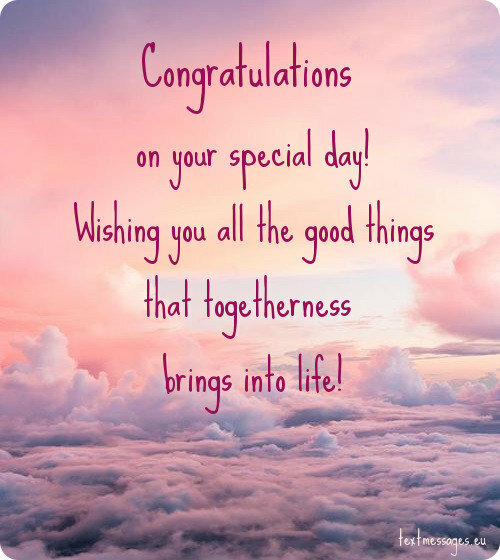 Wishing you all the best, congratulations! The love that you give each other every second of your lives is insane. It’s wild, enormous and absolutely amazing. I’m so happy that you two have found each other. It was definitely meant to happen. Congratulations on your wedding! The best things in life are not things. I can see it when you look at each other. The love you are lucky to have is so beautiful and pure, I’m absolutely blown away by that feeling. 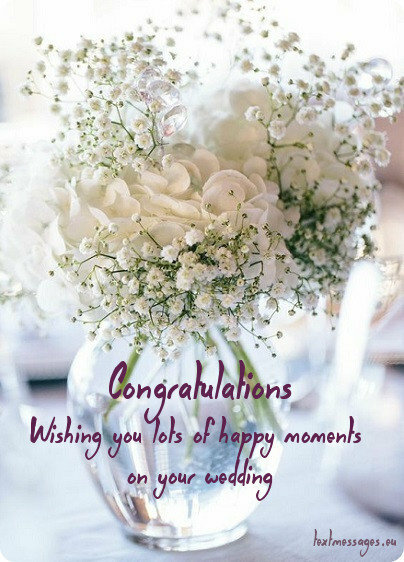 Wishing you all the best, congratulations on your wedding! I wish you to always be patient when it comes to fighting, because no marriage can last without those. The only thing you can do to make it last forever is being patient. So don’t you ever forget about that. Congratulations on your wedding! Love is not about expensive gifts and loud confessions in the middle of the night. And I’m so happy that you two understand that. It means that your marriage will last. 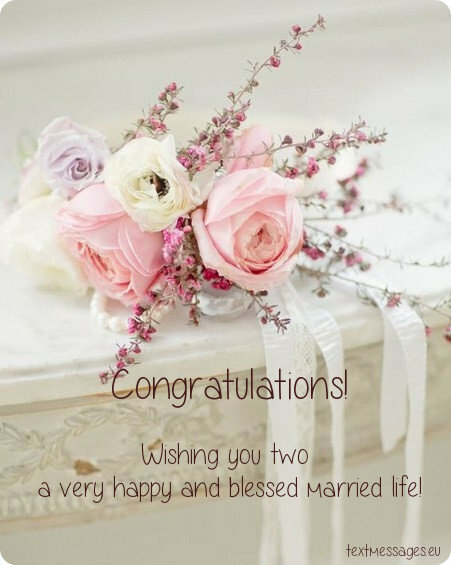 Wishing you all the best, congratulations on your wedding! I’m so proud of you two facing your fears and stepping into this new life together. I won’t lie to you saying that it will be easy, but I know that you can do everything together. 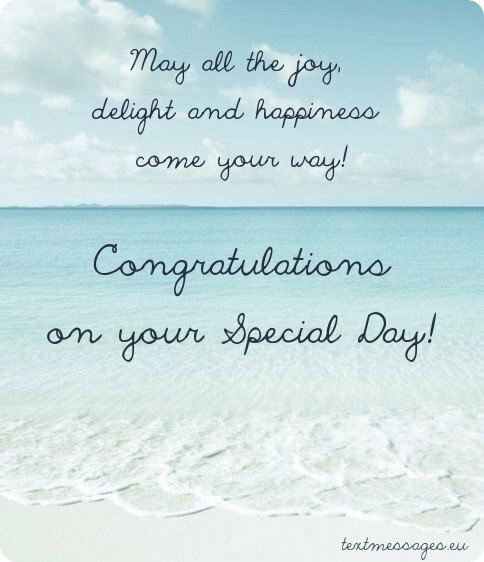 Wishing you all the best, congratulations on your wedding! It is important to have someone you can tell everything. Trust is everything when it comes to relationships. I wish you to never lose this in your marriage. 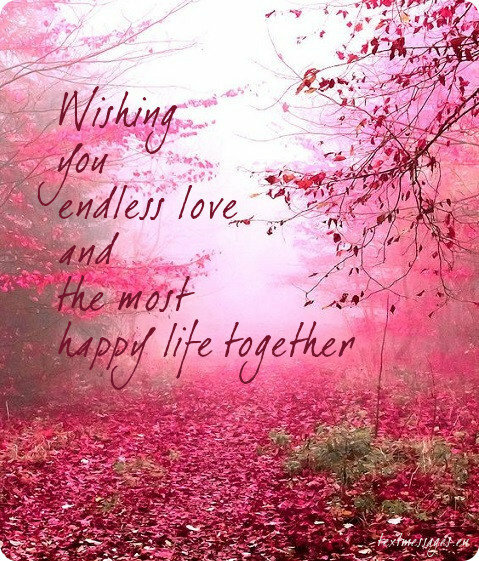 Wishing you lots of love, be happy together! I wish you to spend your life like it’s just an endless honeymoon. Loving each other unconditionally, being together no matter what and not caring about what everybody says. That’s how you make your marriage last forever. Congratulations on your wedding! I’m praying for you two to stay together forever. You are the most beautiful couple I know and I feel so lucky to witness two hearts become one on this amazing wedding day. I wish you lots of love, laugh and beautiful kids. Congratulations on your wedding! Marriage means nothing without love. And love is forgiveness. I wish you to learn how to forgive each other and try to avoid things you should apologize for. Congratulations on your wedding! My heart melts when I see you kissing each other. You look so happy at this very moment, and I wish you to always be as happy as you are now. May your marriage be the happiest marriage of all. Congratulations! Being blessed with love like yours is a miracle. I know that you two were made for each other, so I wish you to learn how to cope with every problem together, ‘cause it’s the most important thing in marriage. Congratulations! Trust is the most important thing when it comes to marriage. You have to be sure that your partner is honest with you. So I wish you to always be faithful to each other. Congratulations on your wedding! This beautiful day is the day you will remember till the day you die. I know that these memories will be one of the best you’ve ever had, and I hope that they will help you to cope with difficulties you may have later. Congratulations on your wedding! Having someone who can wake up in the middle of the night just to say that he or she loves you is the most amazing thing in the world. Just remember one thing: when you want to receive, you have to give. Congratulations on your wedding! The miracle of love is not something you will have for a lifetime. It’s a feeling you should develop. I wish you to learn how make your love stronger with every year you spend together. Congratulations on your wedding, guys! Marriage is a roller coaster. You will have your ups and downs, but don’t you ever forget that you are in a same wagon. It’s all about learning how to cope with problems together. 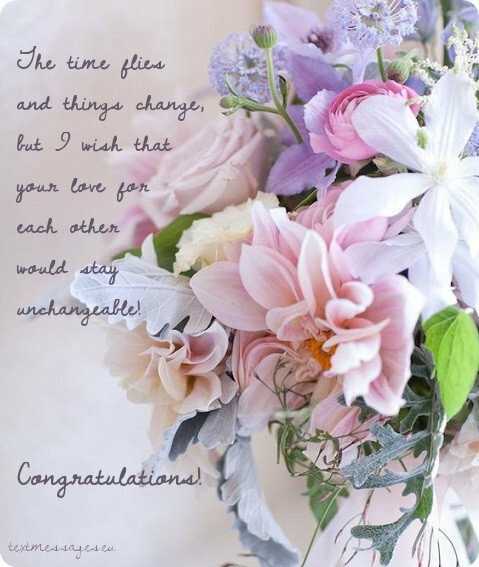 Wishing you the best of all, congratulations on your wedding! Marriage is a hard work, so you have to be prepared for problems, fights and other difficulties. But I’m sure that your love is stronger than all of it. Be happy, always. Congratulations on your wedding! Don’t be surprised if you have problems after your honeymoon. It’s always like that, you know. Just remember one thing: talking about your difficulties is the key to a strong relationship. God bless you both. Have a happy life! I have only one question for you. Is it hard to be the cutest couple in the world? I wish you to always be as happy and sweet as you are now guys. 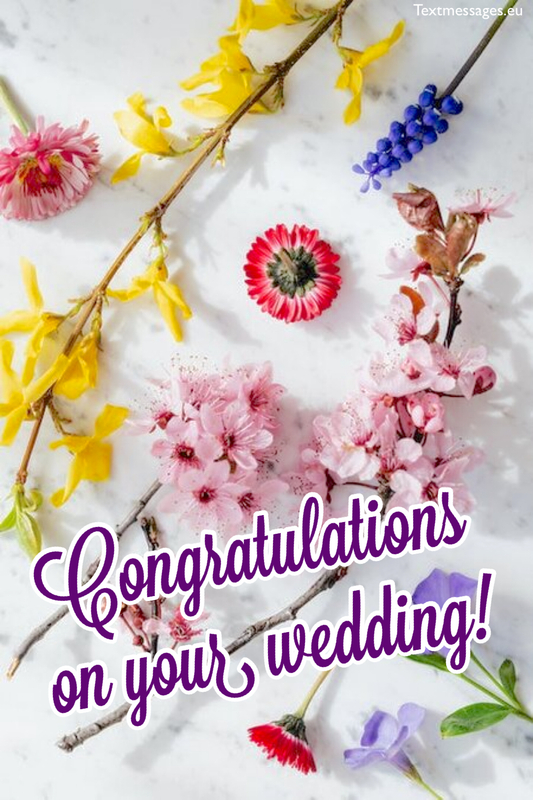 Congratulations on your wedding! Wedding means a completely new start in life and I wish it to be promising and full of high hopes. Congratulations on the wedding! 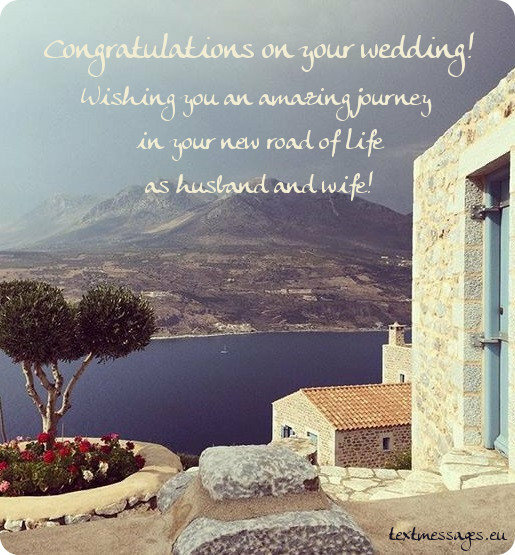 Best wishes to the best newlyweds! 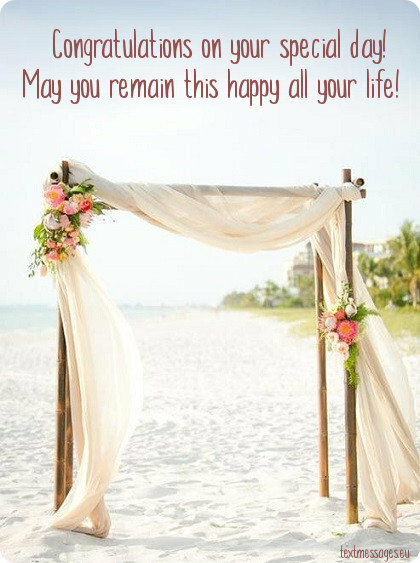 May your wedding day be happy and bright as well as your further life together! Marriage is a very responsible choice and I wish it to be the right one for both of you. Your happiness is in your hands now, and I wish you to hold it tight and not to lose it. Here’s the recipe for happiness in marriage: 50% of love, 30% of trust, 20% of conversations and a pinch of an unexpected pleasure. Good luck! 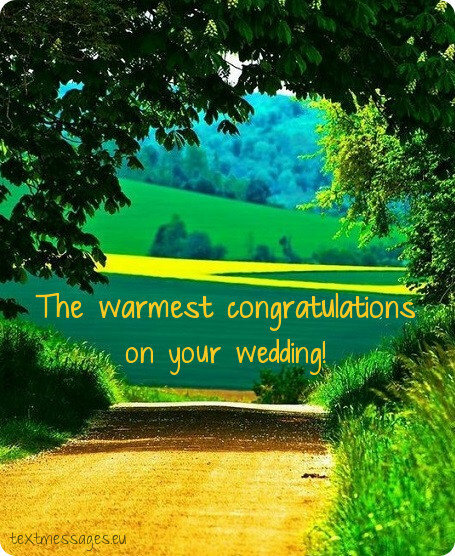 I wish your wedding to be loud, bright and unforgettable and your marriage to be peaceful, inspiring and full of love. Marriage means a completely new way of life. Now you have to share everything you have with one more person, and I wish it would bring you much happiness and pleasure. 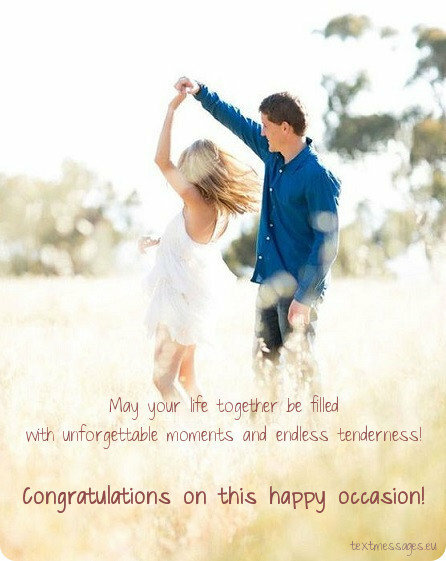 May your life together be full of unforgettable moments, tenderness and love. 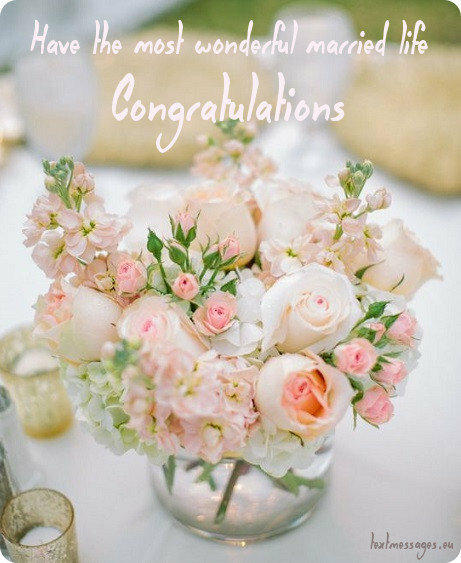 Congratulation on your wedding! On this special day, I want to wish you both only one thing: be creative – only then your marriage will be a real masterpiece. Congratulations! Remember that the real purpose of family life is to make each other happy every single day and live in harmony. I wish you it all. Congratulations on your wedding! There is no need to complicate things in marriage. 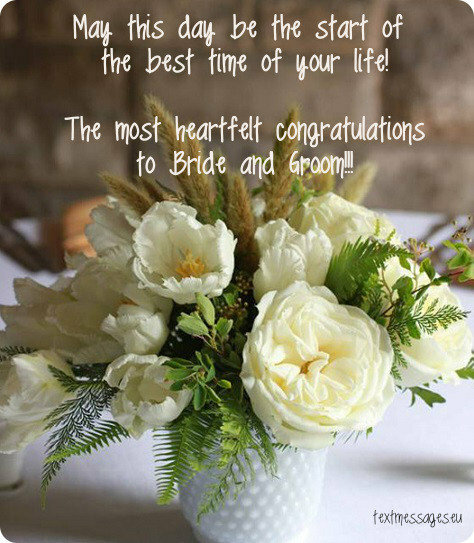 Just enjoy your time together and have a wonderful wedding! If real love exists, then you are a perfect example of that. Keep it up! 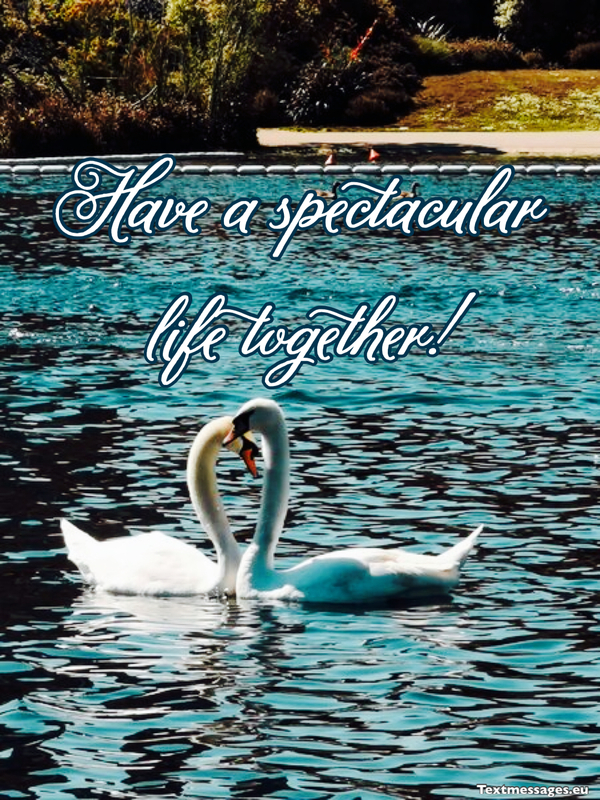 Wish you an amazing life together. Today, on the day of your wedding, you are so happy and joyful. I wish you both to preserve this state for many long years together. 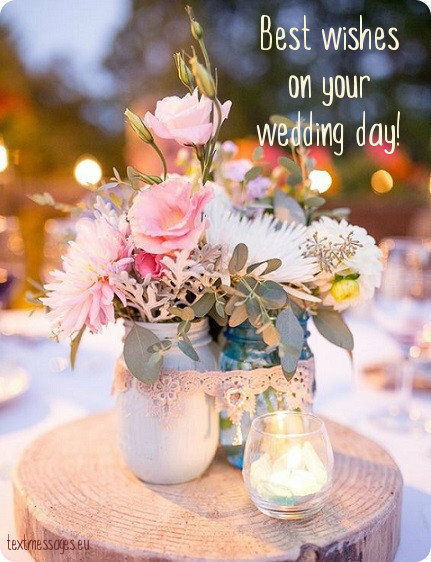 Wish you a wonderful wedding! Wedding is one of the most important events in our lives. It means a completely new way of life, new habits and interests. I believe this change will be for the better for you two. Congratulations! Home is where the heart is. And now your home is where your loving hearts beat in unison. Congratulations on the wedding! Marriage is the peak of love relationship, but still there are many things to improve. I wish you both to train your understanding and strengthen the links between your souls. Congratulations on the wedding! Family life is about sharing all you have with another person. And I wish you both to have only positive and good things to share. Congratulations! There are some things you should keep in mind if you want to have a happy marriage. Be caring, be loving and open to talking. Good luck! 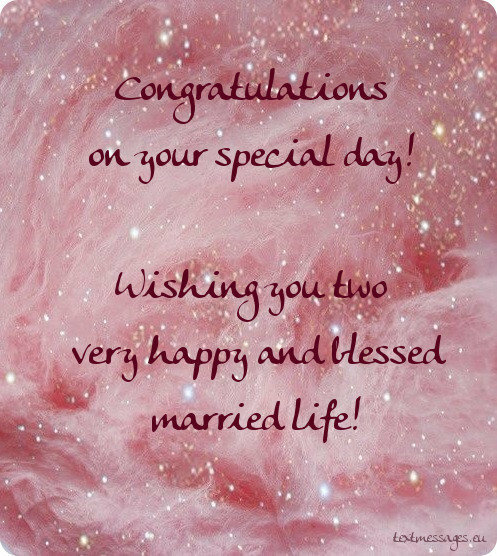 Dear newlyweds, have an amazing wedding, wonderful life together and gorgeous kids! Congratulations on the wedding! The only thing I wish you both is to keep the vow you’ll make on this blessed day. Be true and genuine to yourselves and your partner. Since now your lives depend on each of you, and I wish you would never let each other down. Congratulations on your wedding! Real love will overcome all hardships, that’s why I wish you real, genuine and true love. 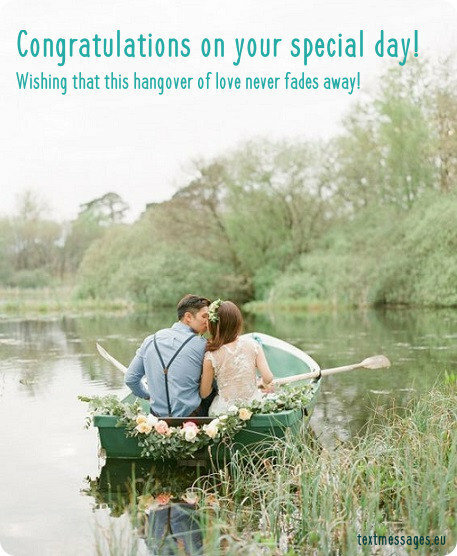 Congratulations, dear newlyweds! The luckiest person is the one who loves and is loved. Dear newlyweds, I wish you both to be the luckiest persons in your marriage. Congratulations! 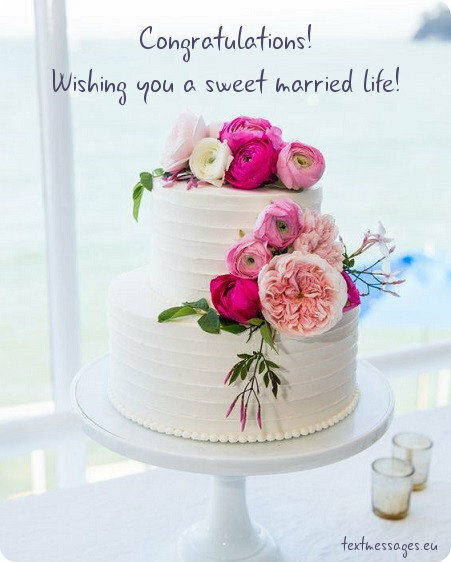 May your love be sweet as your wedding cake, may your house be full of joy and laugh just like today. Congratulations! We’ve got one life to live, so may it be filled with love, tenderness and true happiness! 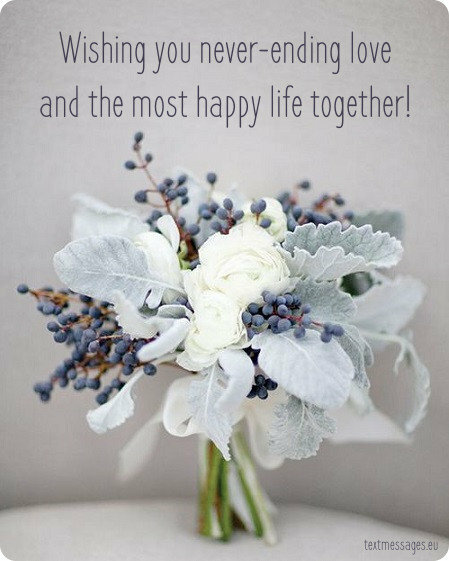 Wish you an unforgettable wedding and a wonderful life together! Every time I look at your amazing couple, it makes me believe that true love exists. Keep it up! It doesn’t matter whether it’s a first date or the tenth year of your marriage, don’t lose that sparkle between you two. Congratulations on your wedding! A beautiful wedding is a nice intro to an amazing family life! 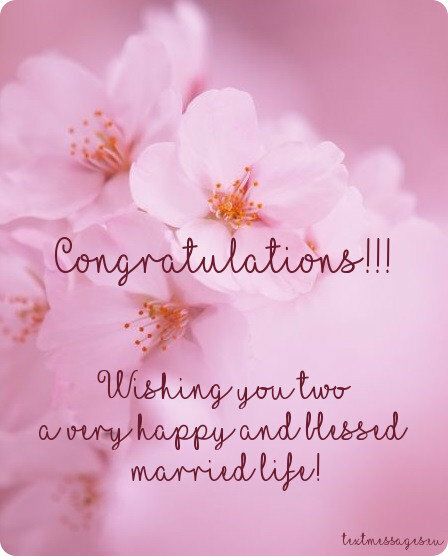 Congratulations, dear newlyweds! Remember that making each other happy is your life mission. Don’t fail each other! Congratulations on your wedding! Love is a wonderful feeling and it has tied your hearts once and for all. Cherish and honor it as long as you can. Congratulations on your wedding! I believe that such a wonderful couple is just bound to success and happy family life. Congratulations on your wedding! Now you’ve got each other and you have to stick together no matter what. May your love be the strongest glue that connects your hearts forever! It’s a new page and it’s just as white and clean as the bride’s dress. Since now you’re co-authors of your love story, and I wish you both to create the most amazing story ever! Today is the day when your souls and your lives intertwine. May this connection be strong and long! Congratulations on the wedding! Many people believe that marriage is the culmination of love relationship, but in fact, it’s only the beginning. May it be bright and joyful! Marriage changes people’s lives and I wish that your changes would be for the better. Congratulations! A wife and a husband are two guards protecting their love and home from sorrows. I wish you to succeed in it and create the strongest family ever. Today you’ll make one of the most important decisions in your lives. I wish this decision to be the right one and I hope you both will never change your minds. Today a young family will be born, and I wish it to be strong and beautiful for many long years. Congratulations on your wedding! Your faces are so joyful and happy in the wedding photos. I wish it would never change. Congratulations on your wedding! I congratulate you on getting married and wish you to show everyone what an ideal family life is. Family is precious and you should do everything it takes to protect it. I wish you both to be strong and loving enough to create the best family. Remember that the golden rule of marriage is to be happy and make your partner happy too. Follow this rule no matter what. I wish you both a happy life in marriage and understanding. Congratulations on your wedding! There’s nothing as beautiful and as hard as good and strong family. I wish your family to become exactly this type. Congratulations on your wedding! 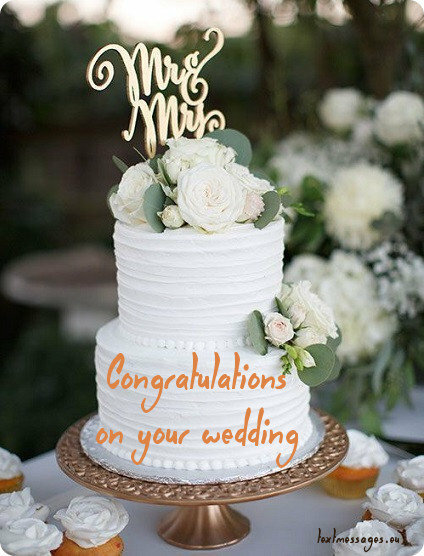 I congratulate you on your wedding and wish that your family would be the safest place on earth, where you can always find a shelter and harmony. 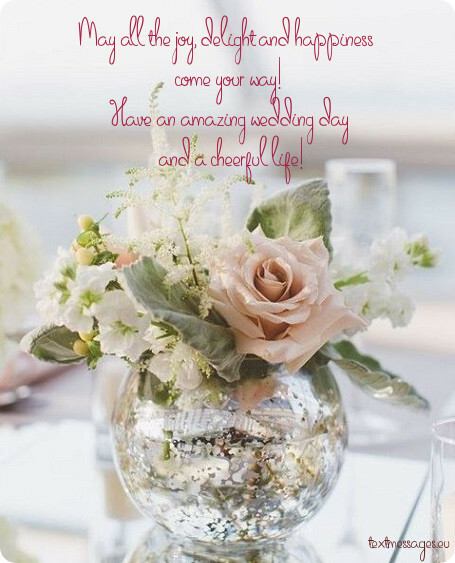 Today everything is perfect: a beautiful wedding, happy bride and groom, high hopes… I wish it all to stay this perfect for many long years of your family life. Congratulations on your wedding! Being a part of a good and loving family is amazing and I wish you to experience it in practice. Congratulations on your wedding! If you ever dreamed of a happy family life, then now is the right time to make your dreams come true. Congratulations on your wedding! 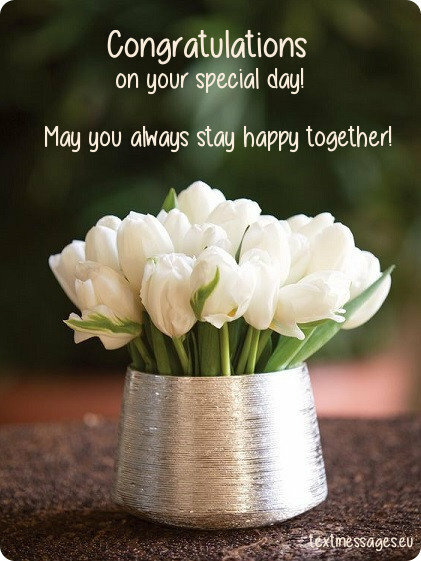 On this special day I wish you to have an amazing and happy life filled with laughter and joy! The most crucial thing in any relationship is understanding, that’s why I wish you much of it in your marriage. Congratulations on your wedding! Getting married means intertwining of two souls together forever. I wish that this special connection between you two would always be this strong. Wish you a happy marriage! May your life together be not as short as this wedding wish! Congratulations! I wish that each new day of your family life would bring many unforgettable moments and emotions. Congratulations on your wedding! 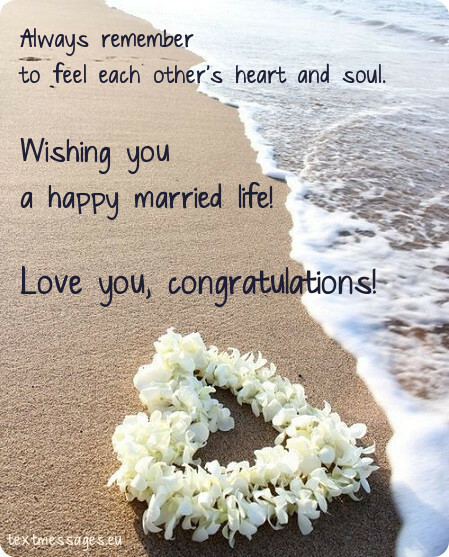 All I want for you is to have a happy married life, and I hope you never get tired of each other, good luck! You both should always listen to your heart, because there’s almost nothing else you can do, because the heart never lies, trust it! Congratulations! Just because you got married doesn’t mean you have to stop having fun! May this marriage bring you happiness and joy to your lives. but trust me, now it will be even more amazing, good luck! All I wanted to say is good luck on your marriage, never leave each other on your downs, because at those you truly need each other. 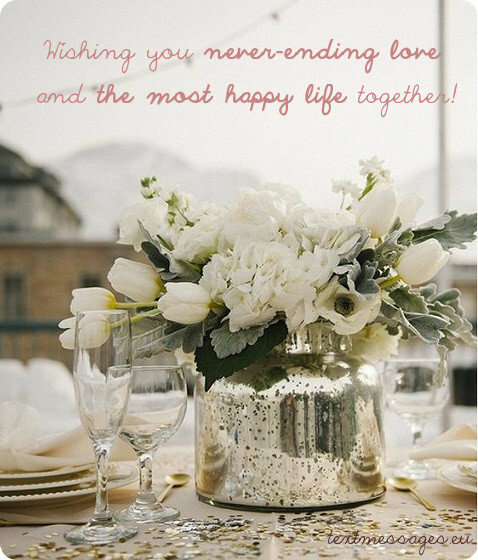 Wishing that it is filled with unbounded love and happiness! Let the good fortune, love and understanding always stay with you. An important part of love is being able to make each other smile. You cannot look at each other without smiling, and that’s how I know you are a perfect match. Congratulations on your wedding! 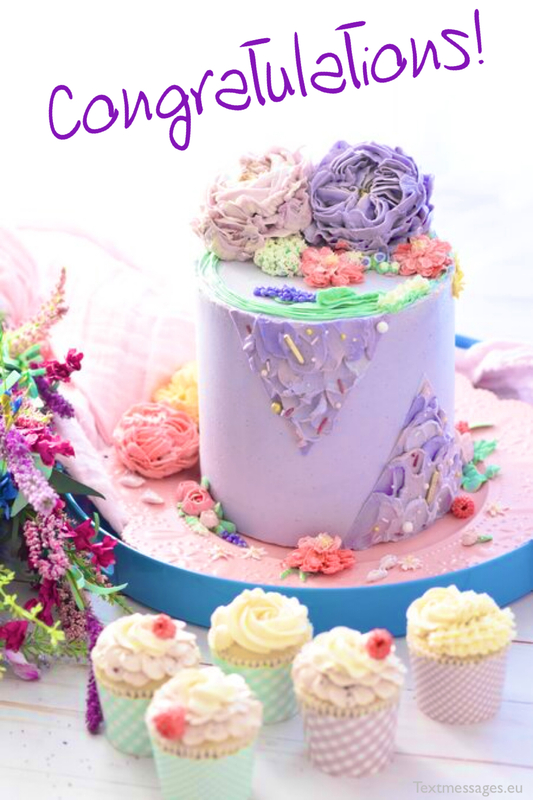 Wish you love as sweet as cake on your wedding day! Marriage is easy when two people love each other. I know that for you this union is going to be the biggest blessing in life. Best wishes! For me you are the example of a perfect couple. May your union be the strong and everlasting. 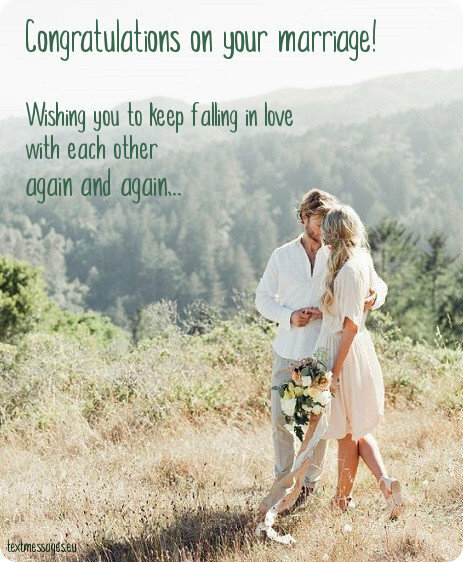 Wishing you a happy marriage! Weddings are astonishing. They are some kind of apogee of love relationship and the beginning of family life. On the day of your wedding, I wish this wedding to be the one and only in your lives. It’s not a secret that love like yours is something you can find only in movies. 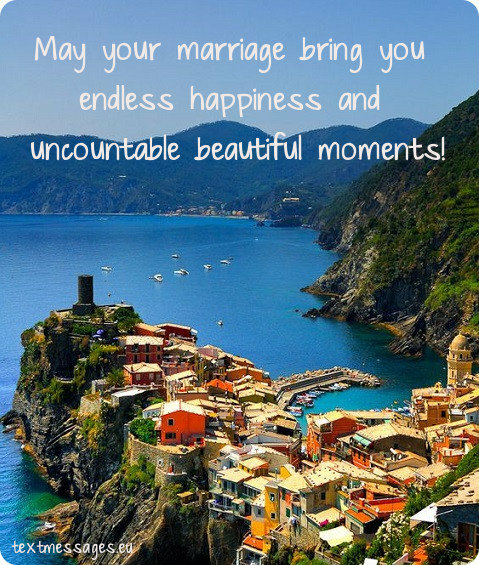 May your marriage be even more joyful and happy than you expect. May all the joy, delight and happiness come your way! 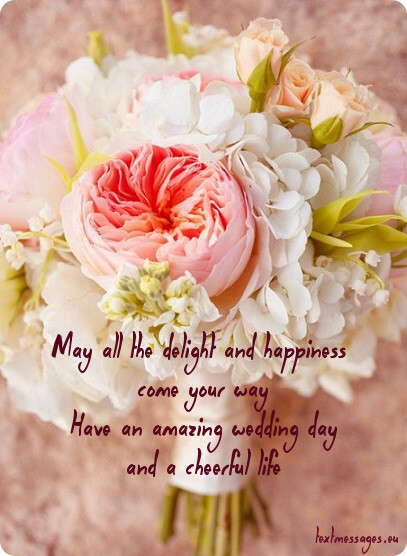 Have an amazing wedding day and a cheerful life! On your wedding day I’m not wishing you never to argue, because you cannot avoid it. But I wish you to learn how to compromise. May your love grow stronger with every day. Amazing groom and a beautiful bride deserve a wonderful wedding. So go and get it! Beginning new life together is scary. But when I look at you I realize that you have nothing to be afraid of. May the years ahead be filled with love and harmony. 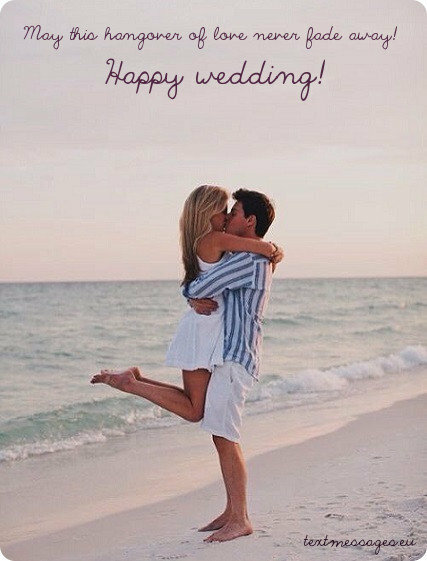 Wishing that strong trust and never-ending love occupy your marriage! Looking at you I understand that marriage is not a simple routine with no end. It’s a wonderful journey full of love and acceptance. May it be so forever! Every wedding is an introduction to a family life. I wish yours to be the best one! What’s interesting about wedding gowns is that they are black and white. But I wish your wedding and life together to be bright and colorful! I’m so grateful for having an opportunity to share this wonderful day with you. Your love is my biggest inspiration, and I’m sure it’s going to last forever. Wishing you all the best. The biggest cake a one can have is a wedding cake. And the biggest happiness a one can have is the family happiness. Wish you to have both! On your wedding day I wish you to never stop looking in each other’s eyes the way you do it today. 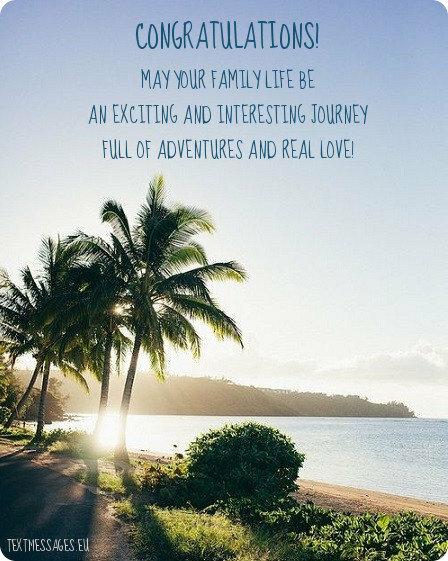 May this day be the beginning of the most spectacular adventure of your lives. 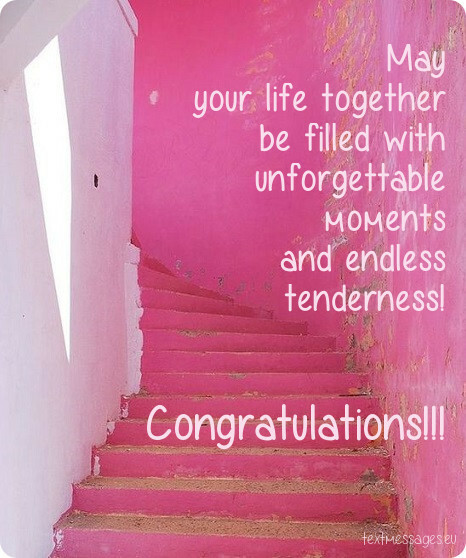 Hearty congratulations on your wedding! Two stars of yours create an amazing constellation! Finding someone who you want to spend life with is extremely hard. I’m so glad that you guys have found each other. I wish you a lifetime of happiness and love. 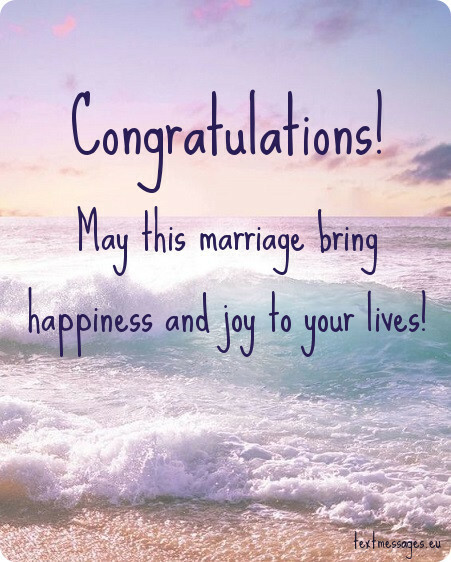 May your wedding be happy just as you and your life together! A wedding day is just twenty four hours that eventually end. But it is obvious to everyone that your love will last forever. Wishing you love, joy and happiness. 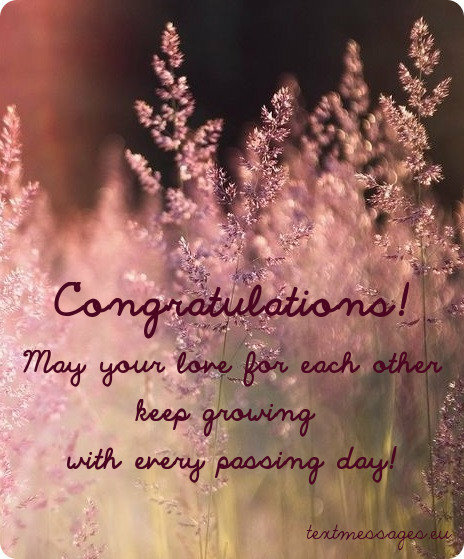 Wishing that your love for each other keeps growing with every passing day! May this wonderful day stay in your memory for many long years and warm you heart at difficult times. Wedding is the triumph of love and I wish it would never end for you two.